JULIA SPENCER-FLEMING: Usually, when we have a guest who writes as part of a team, we like to explore how the dynamic works. Since Jeff Cohen is collaborating with E.J. Copperman, who is... Jeff Cohen... I'm not going to ask. I don't want to disturb the delicate balance. We have several prolific writers here at Jungle Reds who produce two to three books a year, including Jenn McKinlay, Rhys Bowen, and Edith Maxwell. I can, however, honestly state none of them has ever released books in two different series on the same day. Thank heavens, we always say writers aren't competing against one another. 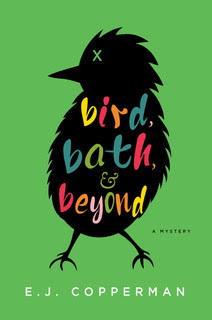 I hope your monthly book budget runs to more than one purchase, because you're going to want to get both BIRD, BATH AND BEYOND and THE QUESTION OF THE DEAD MISTRESS from two of the funniest cozy mystery writers around. At a conference recently I was asked (as authors occasionally are) to name my influences. And I always cringe at the question because the artists who actually have influenced me had virtually nothing to do with the kind of thing I have ended up writing. My influences are not Agatha Christie, Raymond Chandler, Dashiell Hammett or Tony Hillerman. I admire the work of each of those masters, but they didn’t set me on any path other than to want to read more of their books. When I was writing a Capstone project for my master’s degree about six years ago (a non-mystery novel that was never published, possibly for good reason) I was required to list in the bibliography works that had influenced my thinking for the project and my style in writing it. Mostly I lied. 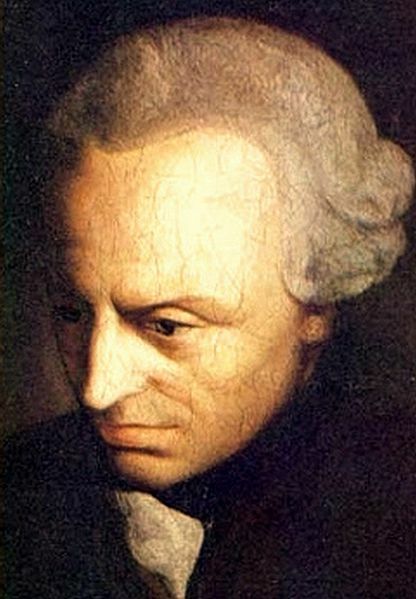 I brought up Cicero and Kierkegaard and Kant, for goodness’ sake, all of whom I had read strictly for courses in the master’s program and have completely forgotten about since. The conference panel at which I was asked the question was about writing books in the mystery genre that are also (hopefully) funny. So I finally felt comfortable uttering the one name that really has had an influence on my writing since I picked up a crayon in second grade. The one artist whose style I might not have directly emulated, but who definitely has had an impact on every work I’ve ever written. Bugs is a demon, a wiseguy, the kind of comic nuisance you’d never want to face as an adversary. But he never punches down. That is, he doesn’t use his lethal wit on anyone who hasn’t directly come after him. He doesn’t attack the defenseless or the weak—he only makes fun of those who deserve it. I’ve always tried to create characters who follow the same code. They’re smart and funny, but they don’t ridicule anyone who isn’t flat-out asking for it. I have two books that were published on October 9 (it’s a long story, and it gives me headaches, so don’t ask), and their main characters are very different, but they hold to the code. Kay Powell, the main character in BIRD, BATH AND BEYOND, is a theatrical agent whose clients are all animals. The non-human kind. In this, the second book in the series, she’s representing a parrot who might be the only witness to a murder. And Kay, a showbiz kid who left the act to get a law degree and become an agent, runs into a lot of people who think the bird should just speak up and name the killer. She hears that from police detectives and reporters. To the cops she explains what is and is not possible with parrots. To the reporters, whom she sees as crass leeches trying to destroy her privacy, she’s slightly less patient. “Yes!” a couple of the reporters yelled out. It was a pity. Because I didn’t want to get in trouble with the FCC, my planned two-word statement was not going to be usable. Samuel Hoenig, on the other hand, is not trying to be a rapier wit. Samuel, who is the narrator of THE QUESTION OF THE DEAD MISTRESS (also published October 9, and it’s still a good policy not to ask me why), has an autism-spectrum disorder and answers questions for a living. When a woman asks whether her husband is having an affair with his college sweetheart, who happens to be dead, Samuel does not try to ridicule her motives. But he doesn’t understand them. “Because it is physically impossible for a living man to have a mutual relationship with a dead person,” I said, marveling at the idea that I even had to point out such an obvious fact. They approach things differently. Samuel isn’t trying to make you laugh; it wouldn’t occur to him to do that. Kay uses humor to deflect and get the upper hand. But neither one of them will take advantage of someone weak or unfortunate. It’s Bugs Bunny as a philosophy. You can keep your Kierkegaard. 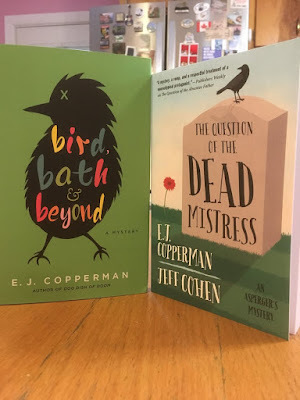 E.J.Copperman writes a bunch of mystery series, but the two coming out on the SAME DAY in October are BIRD, BATH AND BEYOND in the Agent to thePaws series and THE QUESTION OF THE DEAD MISTRESS in the Asperger’sMystery series. JULIA: Thank you for the shout out for the Smithie, Jeff! 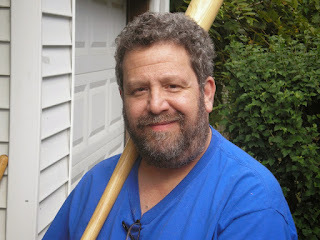 Readers, you can learn more about Jeff Cohen at his web site, and also friend him on Facebook and follow him on Twitter as @JeffCohenWriter. E.J. Copperman, who is on Twitter as @ejcop, also has a web site and a blog, SLICED BREAD. Congratulations on your two new books, Jeff . . . I’m certain Bugs is happy to have influenced your always-delightful writing and I’m looking forward to reading your newest stories. Thank you, Joan! I hope that Bugs--and his "handlers"--would be proud of the mention. I know, right? When Jeff tod me, I started laughing. Then I apologized. I asked, "Didn't your publishers talk to one another?" The answer of course is no. Publishers barely communicate between editorial and marketing in their own imprints. Thank you, Edith! Barney (in the book) is a yellow Amazon because when I Googled "talking parrots" that's the one that came up. No, I don't have a parrot. I have a beagle. Which is an experience in and of itself. Both these books sound pretty funny to me and I do love funny! Then you'll love Jeff/E.J. He's a genuinely funny writer. You're too kind, Julia. Accurate, but too kind. Jeff, I love that Bugs Bunny is a major influence. You had me right there. Both books sound great, too! I particularly appreciate mysteries with humor in them. Thanks also for the link to the Smithie's column. It choked me up. Beautifully written and so very honest. That's one fine daughter you raised there, Julia! Congratulations on surviving the double book launch, Jeff. 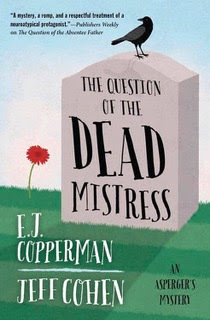 I have read several of your E. J. Copperman books, and enjoyed them enough to keep an eye out for the next one. I guess it's time for me to head back to the bookstore. Congratulations, also, on mastering the "who were your influences" question. I think Bugs Bunny is a perfectly acceptable philosopher to steer by, and probably more relevant to daily life than Bergson. I would have to think long and hard to come up with a list of my own influencers. So much of my philosophy has evolved from encounters that left me thinking, "Oh, he's full of . . ." Perhaps it's an exercise in rejecting the stuff I don't like, until I'm left with what I do, in which case my influence would be Tigger. Julia, Victoria's essay is phenomenal. So honest and moving and mature WAY beyond her years. Breaks my heart. Thanks for sharing the link. And Jeff: Bugs Bunny? Seriously! Such a perfect answer. It got me thinking about cartoon characters I'd pick as my inspirations. Passing quickly over Jessica Rabbit. If only! Oh, that wascally wabbit! I grew up with Bugs and agree, his is a great philosophy by which to live! And funny is sorely needed, now more than ever--I'll be looking for your double-releases, E.J./Jeff! Thanks, Flora! Hope you like them! Congratulations, Jeff. I remember a little bit of Kierkegaard, Kant, and the like. I much prefer Bugs Bunny. Well, when did Kierkegaard ever ask Doc what was up? Would that have been so hard? Congrats on your new releases, Jeff! 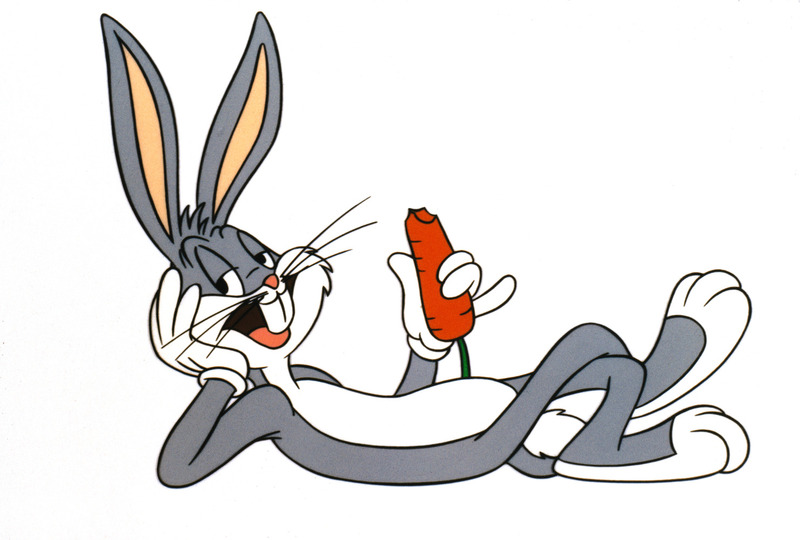 Bugs Bunny is as good an inspiration as any. I've read several of your books and enjoyed them, so I guess I have Bugs to thank for that! My goodness, where to start. Jeff, congratulations on the books and thank you for your insight into Bugs Bunny. I may have to go back and give him a second look. Then I plan to read "The Question of the Dead Mistress." Thank you for posting the link to @MaineMillenial. I'll need to go back and re-read that one too. Several times. Jeff, excellent column. A smile and a good thought at the same time. Thank you. That is brilliant! Brilliant! And I’ve never thought about punching down -that is a fascinating concept. You're the best, Hank! Thank you! And I'll bet you already know why. Because the world is nuts? The world you and I work in, surely. Congratulations on the books, Jeff, and great covers on both! We can all use a little more funny in our lives! I should add Jeff is one of the hardest working writers in the mystery biz, as you might be able to tell from the fact he has books from two different publishers coming out on the same day. We had dinner together at Bouchercon this past September, and I had to admit I had lost track of which series was where. He's written two series as Jeff Cohen, three and E.J. Copperman, one - the Asperger Mysteries - as a collaboration, as well as short stories, articles and several nonfiction titles. Assuming two is "several." Thank you, Julia, for inviting me here and making me feel so welcome. More reading for us mystery fans, yay! Jeff, I love your books, no matter what name you use! Today I realized that I’ve fallen behind by about one book per series. I must remedy that, as I enjoy laughing! Congratulations on your double header, Jeff (sorry for the headache of it all) but YAY! for us fans who get a double dose of your wit and wisdom and twisty turny mystery plots!!! Hurray!!! The books sound great! I can't wait to read them both! Two new releases on one day?! However it came to be, congrats, Jeff! I love that you're willing to come clean about Bugs' influence on you. I'm going to have to give some serious thought to the identities of my influences and make sure I'm not leaving anyone out just because they don't fit the mold! Love all your series. I just picked up the bird book at the library, and the other is on order. I remember in high school, a classmate quoted a French philosopher. I cited a Judd for the Defense episode. I'm more influenced by Spider-Man, Star Trek, and popular culture than philosophers. I read in magazine to think what you would tell a friend in the same situation. That has been very helpful in my life. We are often harder on ourselves than on others. Jeff, I am itching to get to your Haunted Guesthouse series and your Mysterious Detective series. I have a couple of each on my Kindle and one paperback, so I'm set to go, hopefully soon. I've read the first two in your Asperger's series, and they are great reads. I need some humor these days, and humor in my mystery reading is just perfect. Congratulations on your double publication day!